This post was supposed to go up last week but better late than never I guess. Here’s what I did when I went to the beach for a few days about a week ago, what have you guys done this summer? Feel free to dm/email me 🙂 Also, as always, don’t forget to sparkle! I didn’t travel a whole lot this summer but I did go to Port Aransas on Padre Island off the southern cost of Texas for a few days. Honestly, Port Aransas has the coolest beach vibes. 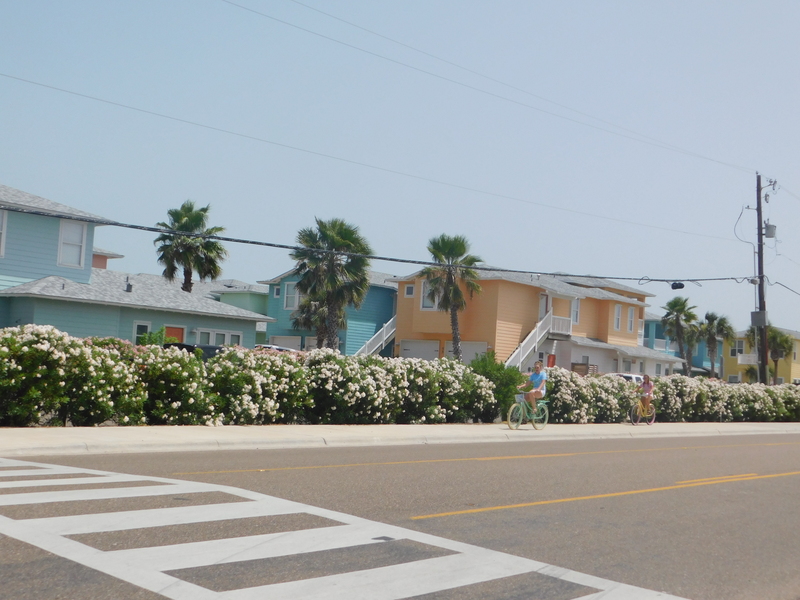 I’ve been to beach towns all around the United States and of them Port Aransas has to be one of my favorites. 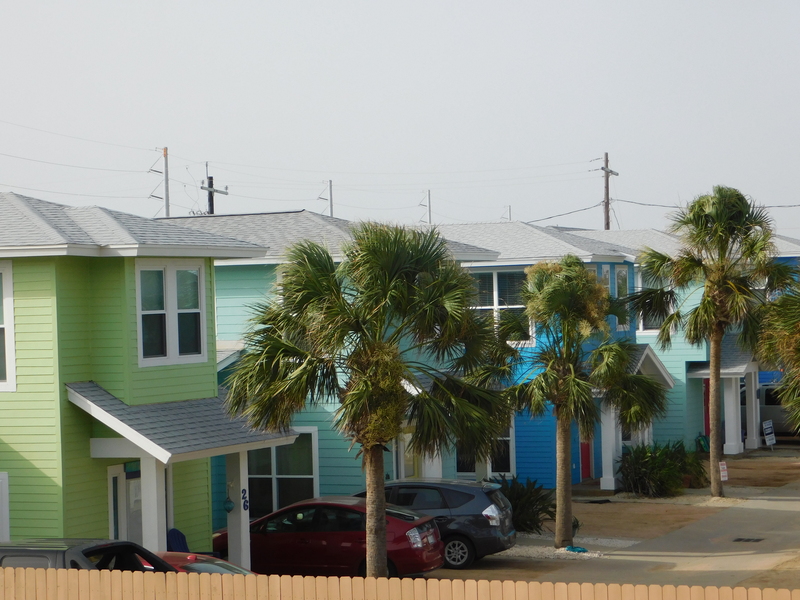 For one thing, the houses are all painted very brightly and it is so aesthetic and cute. To add to the aesthetic, there are palm trees of all different shapes and sizes everywhere. To make the trip even more fun, we rented a golf cart. 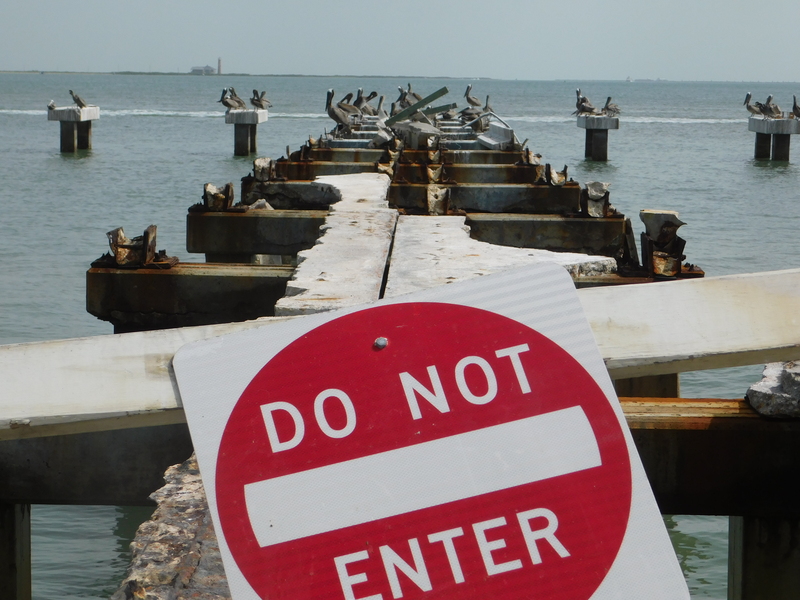 Unlike a lot of beaches in the country, the majority of the beaches on Padre Island, if not all, allow you to drive on the beach as long as you have a special permit. It was so much fun driving around the beach on the golf cart and being able to drive right up to the water for a quick swim. Also we were able to ride the golf cart to the store and to restaurants for dinner which definitely added to the experience. 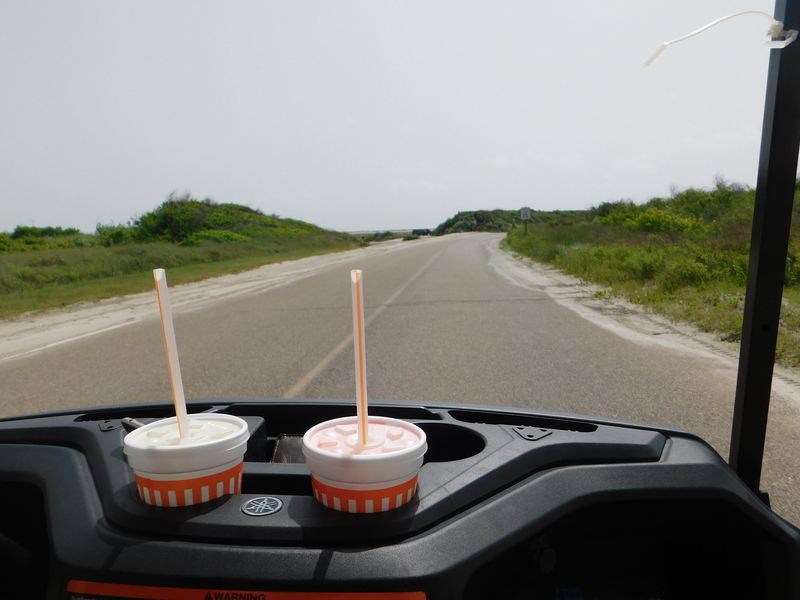 The greatest thing, however, about the golf carts was how many there were everywhere: it definitely added to the beach vibes. As well as spending time relaxing at the beach we explored the town a lot. One thing we definitely were made aware of was how bad the destruction of Hurricane Harvey actually was; more than once we passed hotels and condos still being fixed or left uninhabited and destroyed. 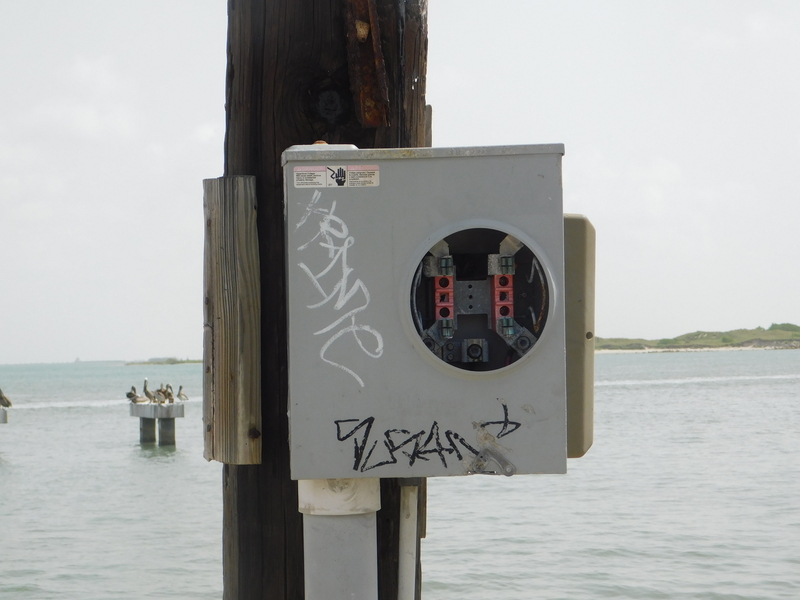 To make things better, during one of our adventures I was able to get some really cool photos of a pier that had been entirely wrecked by the storm. Overall, even though I did end up very sunburned, the trip was very fun and certainly memorable. Don’t forget to check back next Friday for another post! Hey guys! Sorry I haven’t posted in a while, but I’m getting back in the grove. That being said, from now on I am going to be posting normal articles on Sparkle Saturdays and Wednesdays and then I am going to be starting a new page on my site sometime this week called ‘thought of the day’. Because of school work, I am not able to write as many full articles, but I will do my best to post a ‘thought of the day’ at least twice a week where I will journal a quick response to one of your questions for me or write a quick reflection on something I thought of on that given day. As always, don’t forget to follow my social medias to get all the news that sparkles and don’t forget to sparkle! Now, onto today’s post! 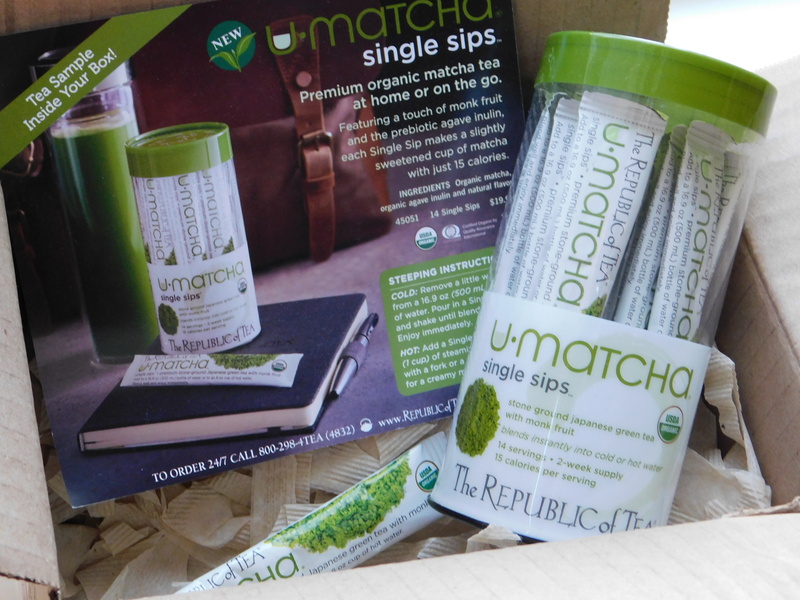 In late July, I received a package filled with a very generous donation of a full pack of Matcha tea single sips and a sample packet from The Republic of Tea for a review. So, I decided to try out one of the sample packets today. The first thing that I noticed was that the tea packets had instructions for a few different ways to prepare the tea: hot, cold, or as a hot matcha latte. 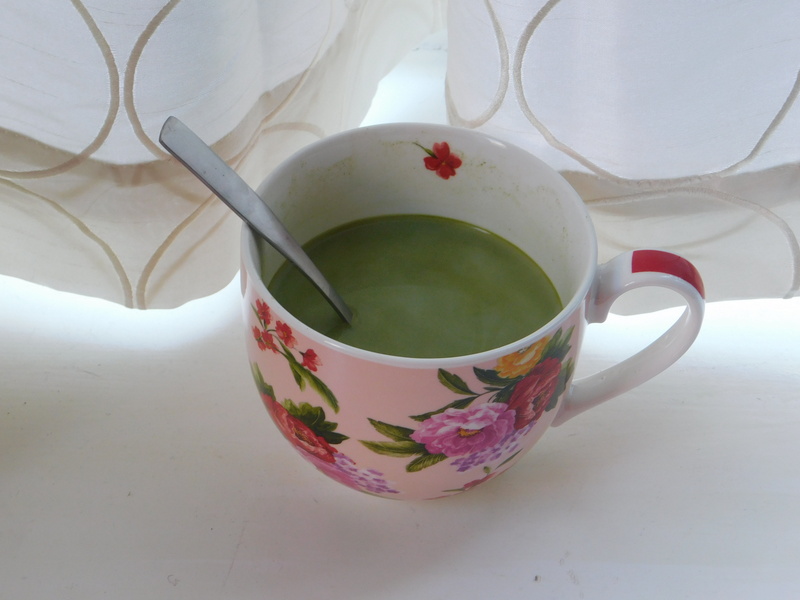 Being me, I decided to make the matcha latte. It was very easy to prepare, all I had to do was make a cup of hot water and stir in the tea packet with a fork and then add milk. Also, the tea was a very pretty green color when prepared. As for the taste, the Matcha tea tasted slightly like green tea only with a slightly more subtle taste. The milk also made it very creamy and nice. 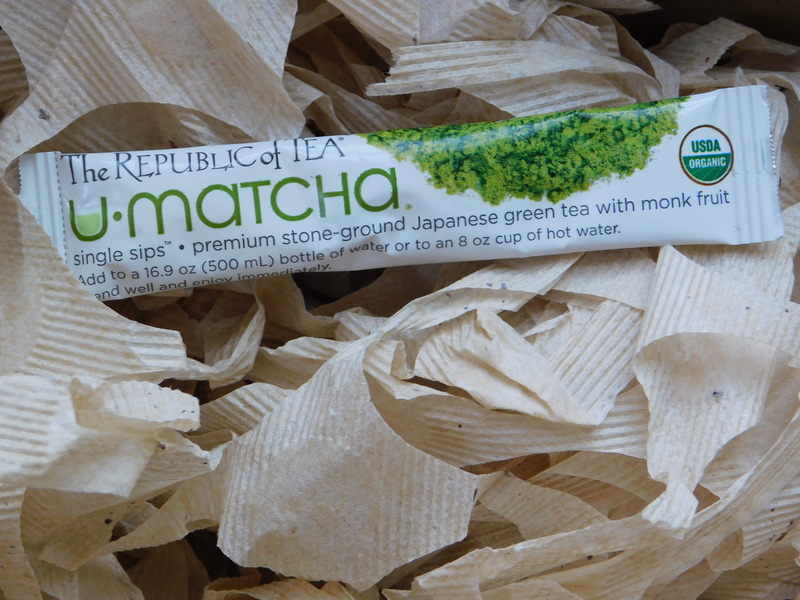 I would definitely recommend Matcha tea, especially The Republic of Tea’s Matcha tea, for people who drink green tea regularly or for those who like tea lattes. In addition to its taste, I read up on Matcha tea and found out that it has quite a few benefits as well. Not only is Matcha tea good for detox, but it also burns calories and boosts energy. Overall, I was really pleased with my first cup of Matcha tea. As for you guys, the full pack of Matcha single sips will be included in the much awaited giveaway that I will be doing soon. Don’t forget to check back on Wednesday for a new fall related article and don’t forget to check my page ‘Thought of the Day’ which will be released soon! Don’t forget to sparkle! 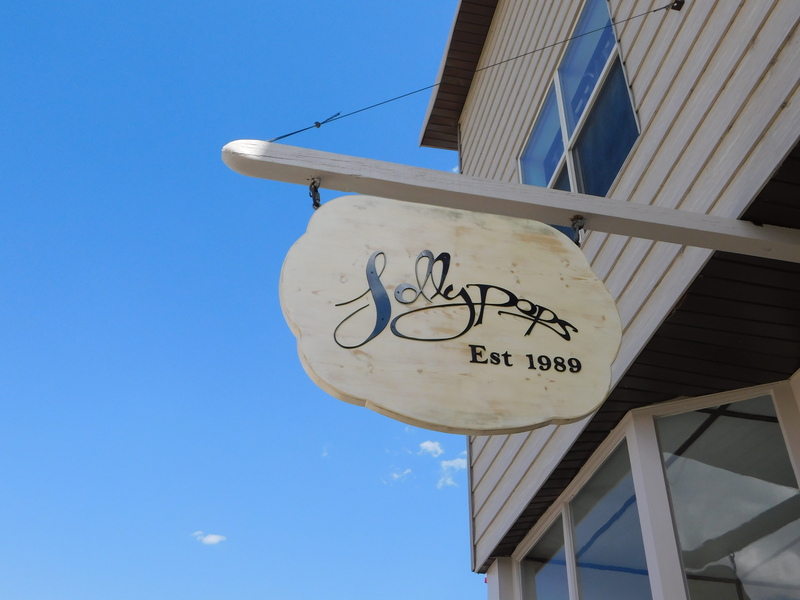 Hey guys, my road trip blog series is finally at its end! Also, I have a giveaway coming up in the next month and so far it has tea, makeup, candies, and other products included. To get updates on that, Subscribe to my website using the form to the right or down below on mobile devices. And, as usual, don’t forget to follow all of my social medias and don’t forget to sparkle! 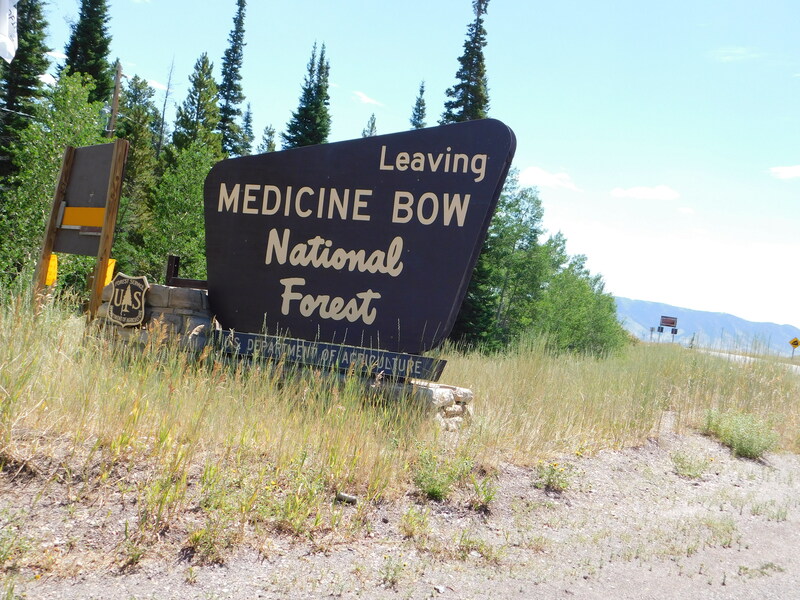 On day four we were supposed to leave to Jackson, Wyoming so that we could stay there and explore Yellowstone National Park and Grand Teton National Park, but I ended up needing a small medical procedure, so we stayed in Saratoga. First thing that morning we called the local medical clinic and then we walked out to go get breakfast from a local shop in town. On the way I got some great pictures of the center of town. 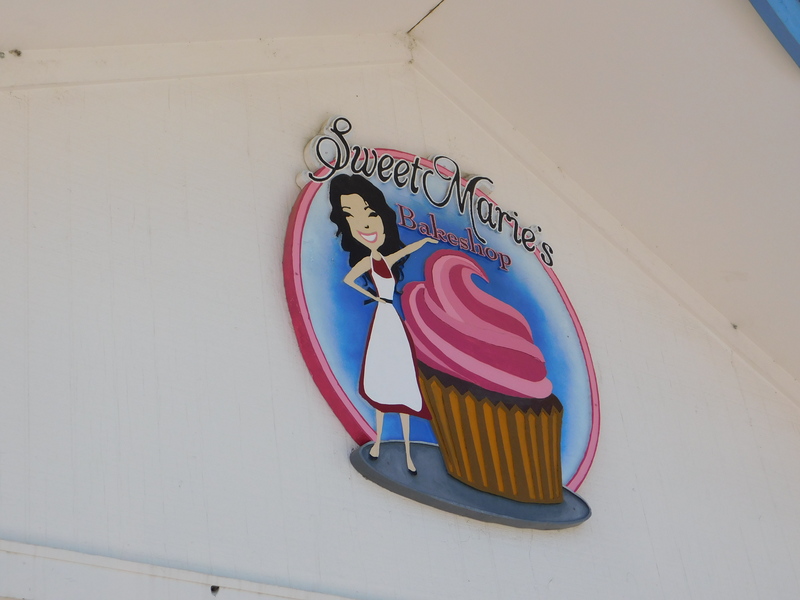 We ended up getting breakfast at this really cute bakeshop on the street called Sweet Marie’s Bakeshop. I got a breakfast burrito and green tea latte and I must say it was delicious. 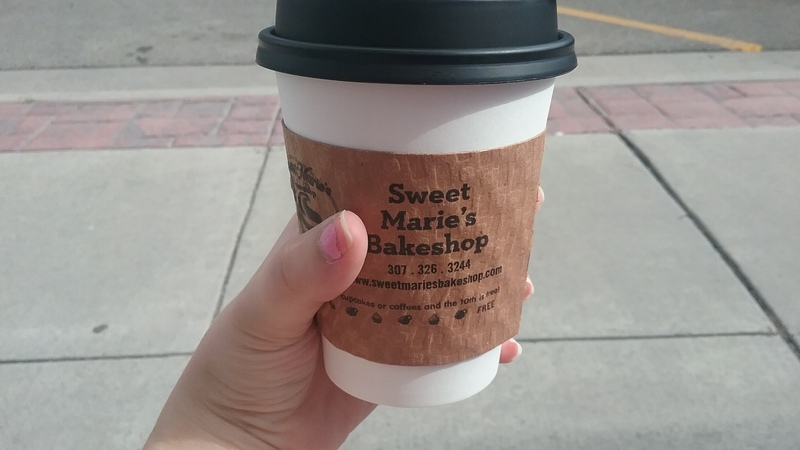 If any of my tea loving readers find themselves in Saratoga, make sure you get a green tea latte from Sweet Marie’s. I dare say it was the best green tea latte I have ever had. 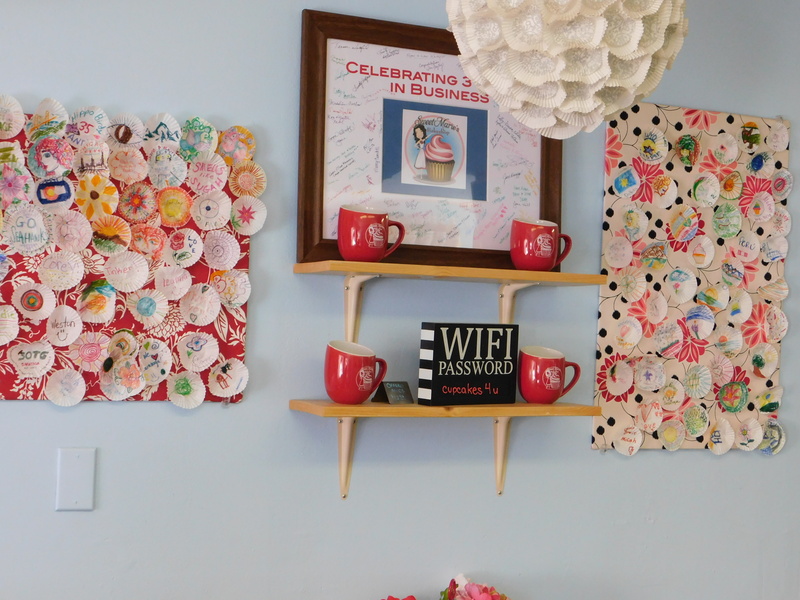 Also, the shop was decorated very cutely and the owner left out cupcake papers and markers so that people could decorate them so that she could hang them on the wall. 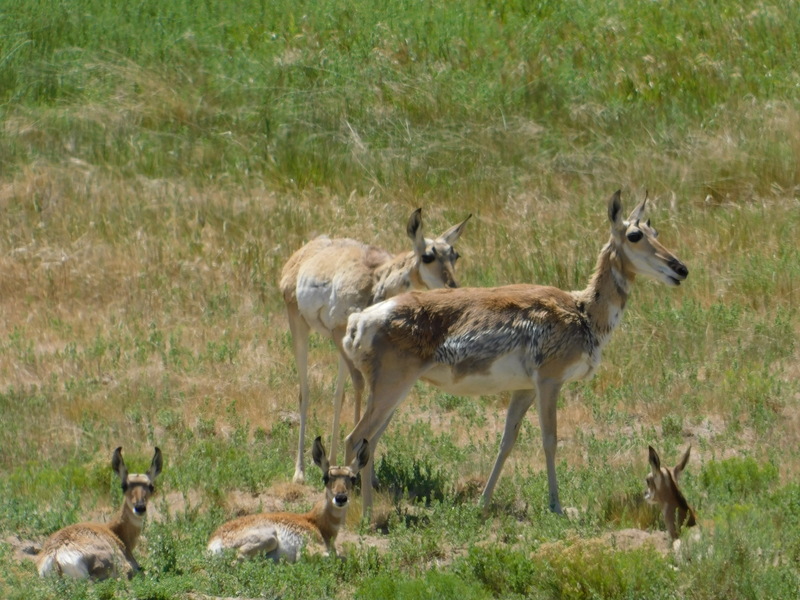 After breakfast, we drove around the outskirts of town and I finally got some pictures of the pronghorn antelopes that we had seen in New Mexico and then hadn’t seen again until we hit the highlands of Wyoming. 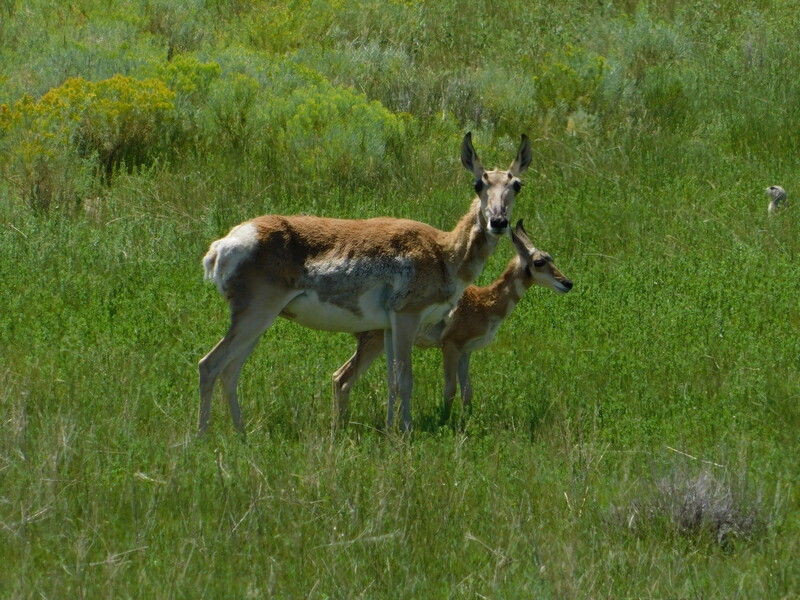 I even got a picture of a mother with its baby. After the ride we headed to the clinic and I got a mini surgery. Although it was a bit painful, afterwards I felt a lot better. The staff at the clinic were incredibly nice and professional and I will forever be thankful for them being able to help me out. 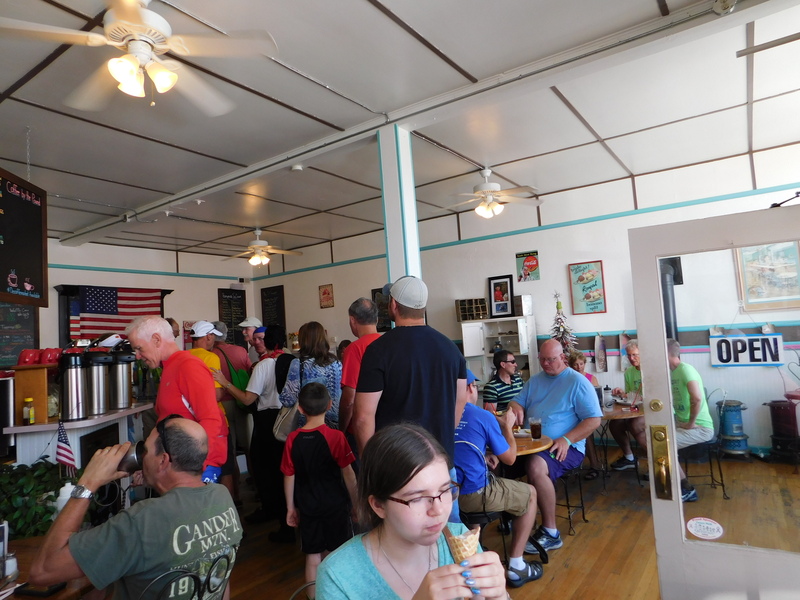 From there we went out to get ice cream from an ice cream parlor right next door to our hotel. I got birthday cake ice cream because I wanted to try a weirder flavor and it was actually really good. My sister got cinnamon and it was also delicious. I basically needed to recover for the rest of the day so I didn’t do much, but it was a good day anyway. I watched Mean Girls and downloaded my pictures from my trip. We ended up booking another night at the Wolf hotel because it was really nice. We still weren’t able to leave Saratoga on day five because I needed to check back in with the doctors, but I have to say that Saratoga was really growing on me. 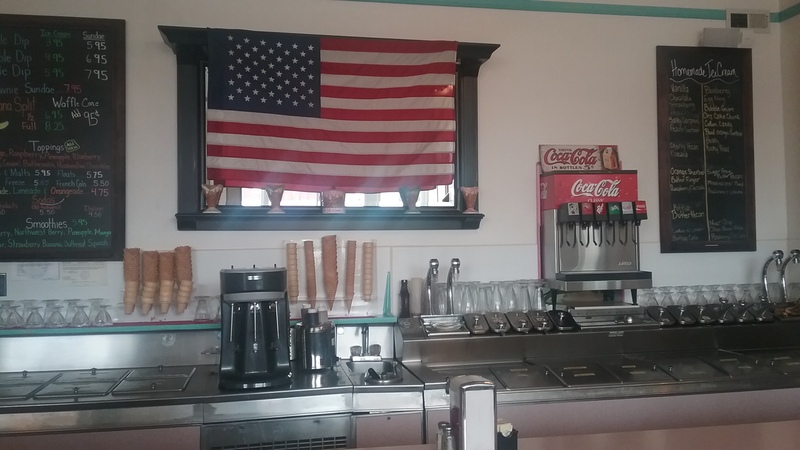 That morning we went to Lollypops, the ice cream parlor we had visited the previous night, for breakfast. I had a Belgian waffle and an iced tea and they were both delicious. Afterwards we decided to explore the Saratoga Museum which was right next door to the clinic. 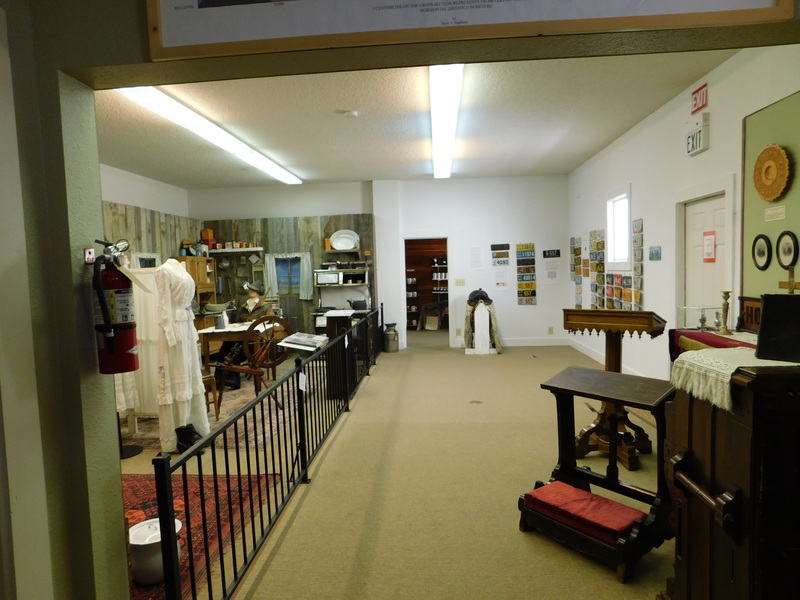 For being a small town, it had a very nice museum! 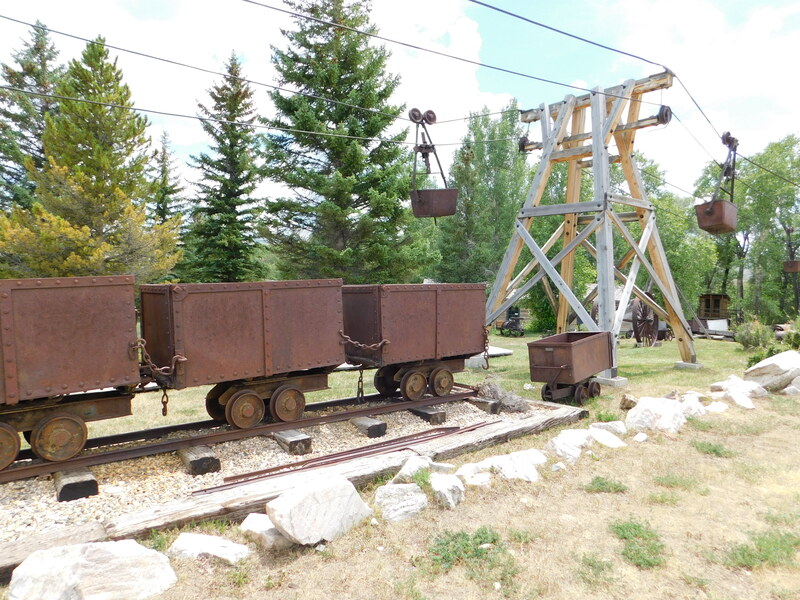 Later that day we went to the Grand Encampment Museum which was in the small old mining town of Grand Encampment. The museum was fairly big and had a really cool set of old buildings they had moved out back from their original locations including old homes and businesses. 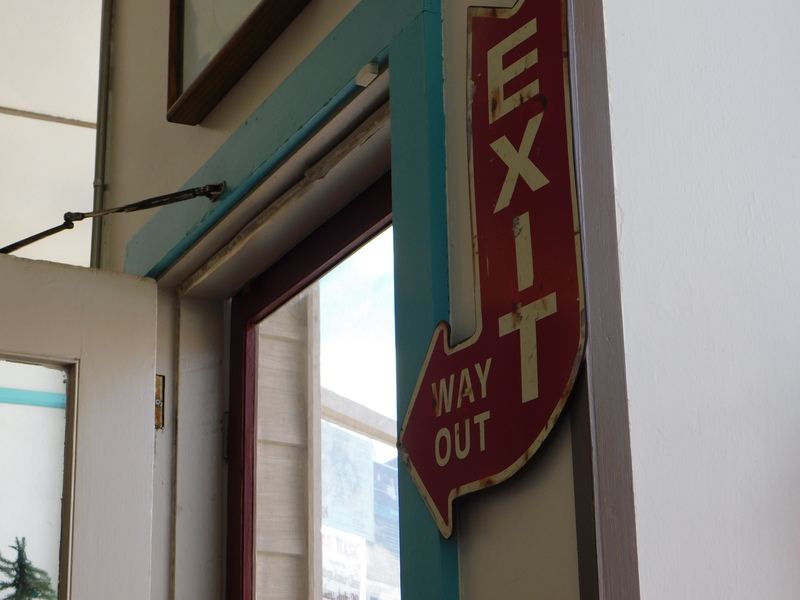 We got a guided tour and were able to go into the buildings where the museum had set them up to look like how they would have during their time. It was really interesting because every building had some sort of story to go with it. For instance, there was a boarding house where somebody could pay a quarter and sleep in a bed with a ton of strangers for the night. There was also a beautiful old home which was built by one man to please his wife Ella who he had kidnapped and brought up to Wyoming after she said she didn’t want to go with him. Because it was a tour, I didn’t take a ton of pictures but I got a few. On the night of day 5, the Wolf was fully booked so we ended up switching hotels to the Riviera which ended up being very nice too. The next morning, we packed up our stuff, dropped off some baked goods and a card to the medical clinic, and started to head home. 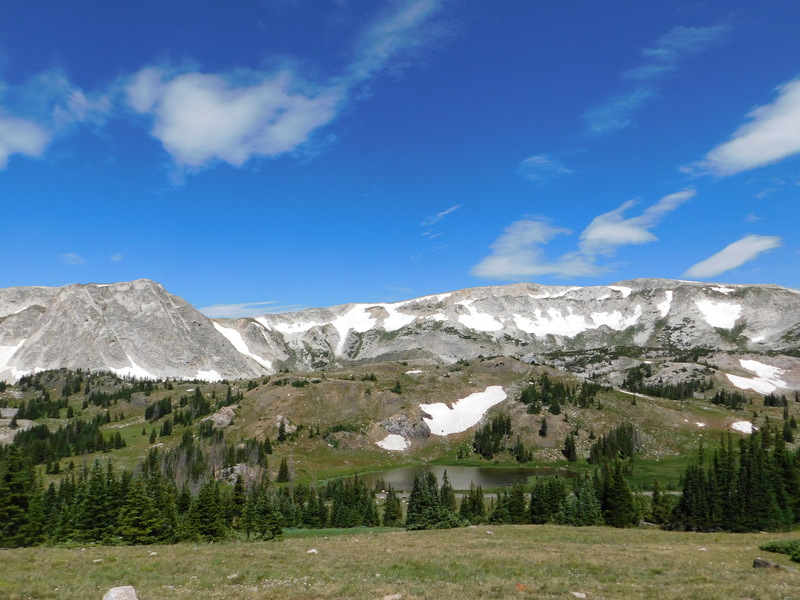 On the way back down through Wyoming we stopped in Medicine Bow National Forest to take pictures. It was actually really cool because the whole way down from Saratoga to Cheyenne there was a bike race going on. 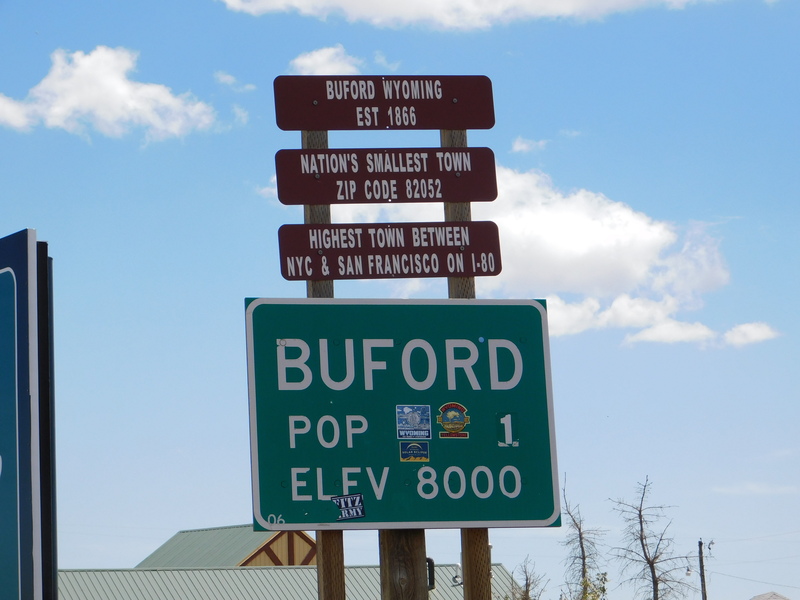 Also, on the way out of Wyoming we passed through the smallest town in America and tied as the smallest town in the world: Buford. 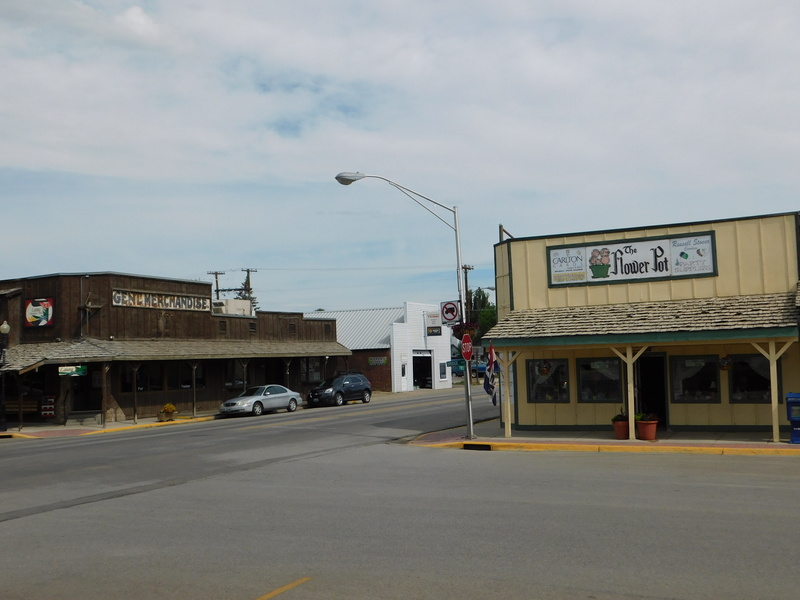 Buford, Wyoming: the smallest town in America and tied as the smallest town in the world. 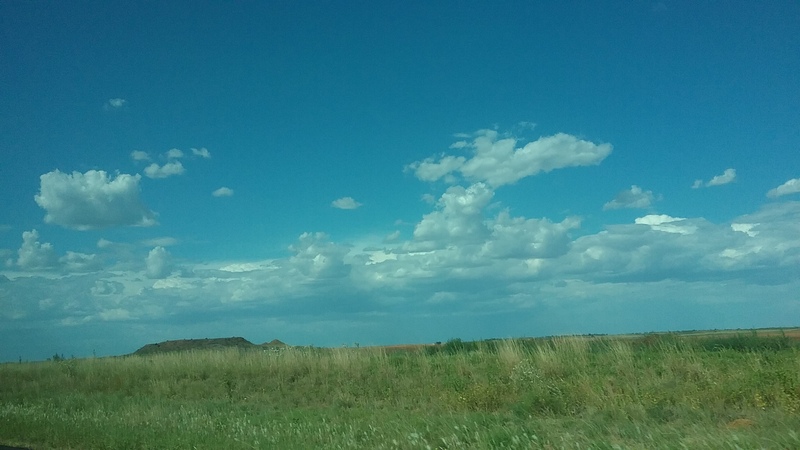 From Wyoming we decided to drive back down through Nebraska and Kansas and both were relatively flat states and slightly boring. 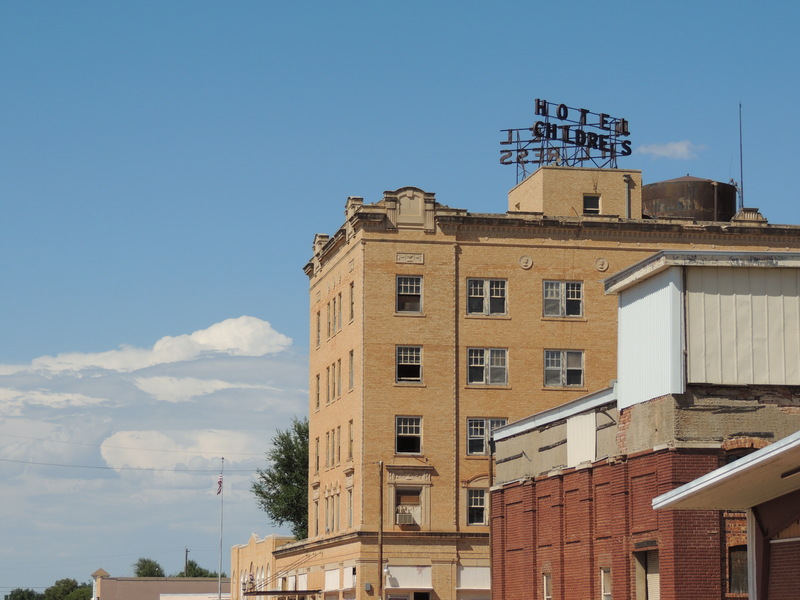 We ended up staying in a hotel in the middle of nowhere in Nebraska that night. 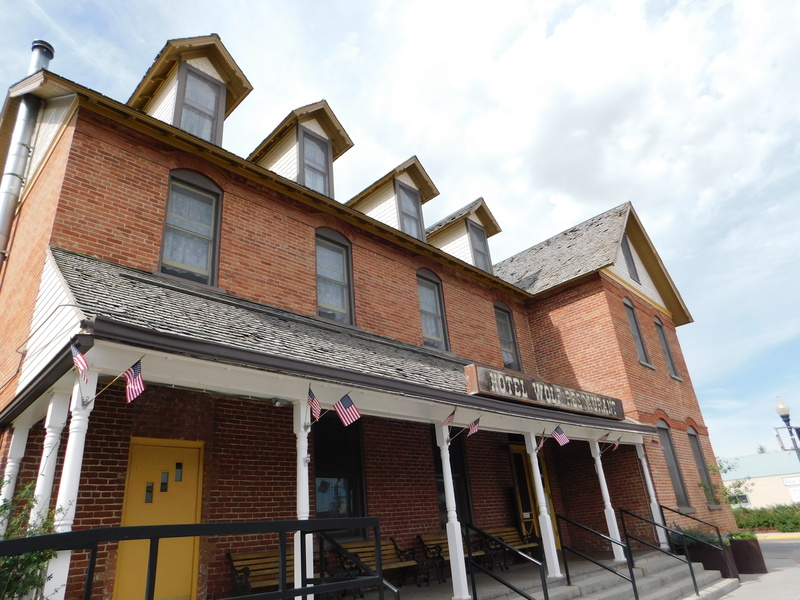 On the morning of day seven we found this really cool place called Pioneer Village which was this really big museum. 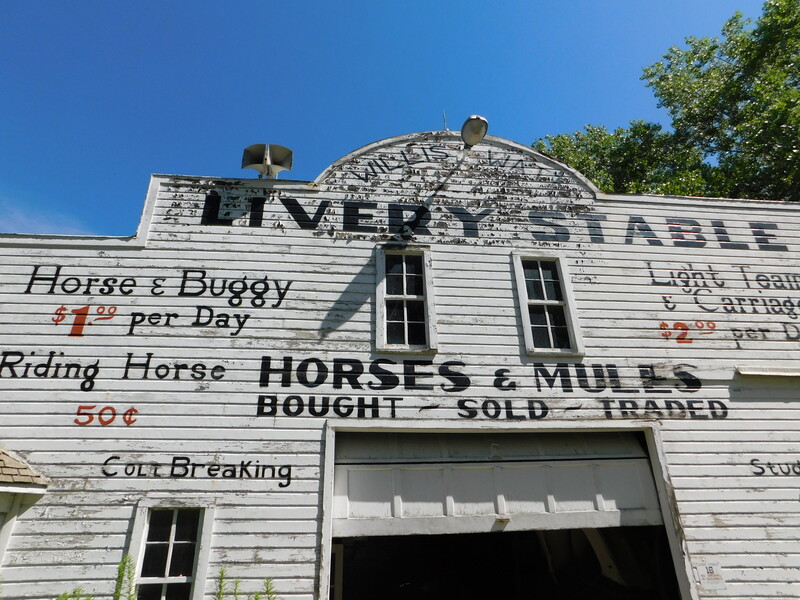 The main building was full of old cars and planes that date back to the early 1800s which was really cool. Out back behind the building there were a lot of old buildings including a church, a livery, an appliance store, and a train station which were placed in a circle to create a cute village. It was really cool to walk through everything and picture what life would have been like back in the 1800s and on into the 1900s. 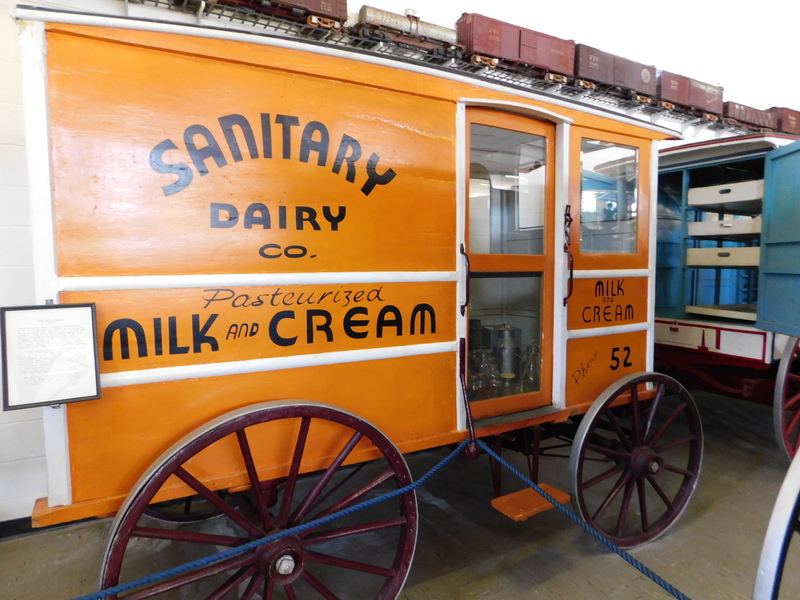 A wagon that a milk man would ride around and stop at houses to ladle milk into pitchers fr the people. It was from the time before milk was bottled. After exploring the Pioneer Village we continued our trek home. Not far from the museum, we passed a farm where there must have been hundreds of cows packed together in small pens with nothing but troughs of food to eat. It was really sad to see because we had seen so many farms where cows had nice large pastures t0 graze on and then there were these cows who had nothing to do but eat. Anyway, the rest of the ride was pretty unimpressive; the landscape was very flat and there was lots of corn. The same goes for Kansas. Either way, we ended up making it home that night. I really enjoyed the road trip, even if it was cut short, and I highly suggest that you guys take it if you ever find yourselves in the area! So yeah, that was my road trip blog finale! Prepare for upcoming back to school posts and, of course, a giveaway! I have posts scheduled for the next few weeks so be sure to subscribe to Sparklenews.com and check back every Tuesday and Friday to see those. Don’t forget to Sparkle! Hey guys! I’m back after a week of inactivity. I have been really busy with summer reading and homework but I’m really sorry. That being said, from now on I am writing my posts ahead of time and scheduling their posting, so you can bet on the fact that there will be a new post every Tuesday and Friday for sure! So, you should definitely subscribe using the form on the side bar. For other news, I am happy to announce that I am going to be holding a giveaway here on Sparklenews.com! More information will be coming up in future articles and on my social medias so make sure to follow those and check back weekly for updates. Also, I would like to thank you all for the recent incline in views I’ve been having, I really appreciate it. 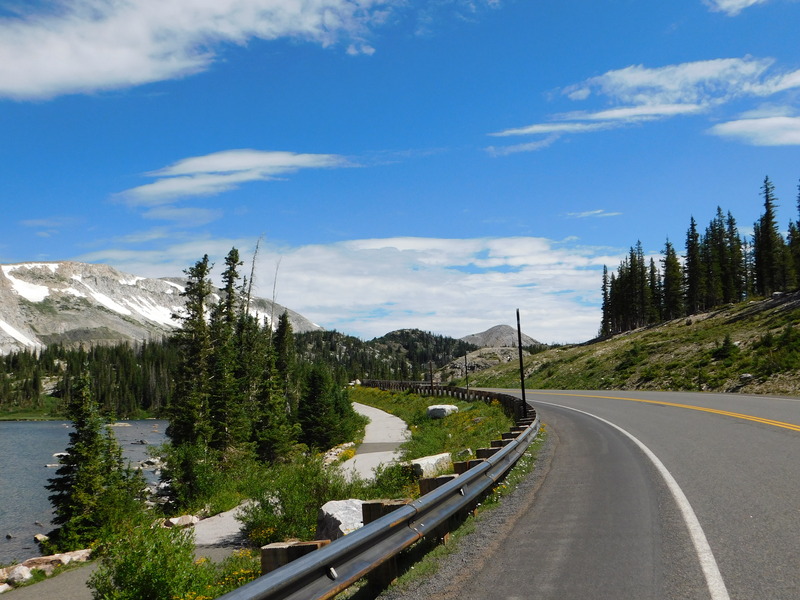 Finally, don’t forget to read road trip blogs day one and two if you haven’t already! 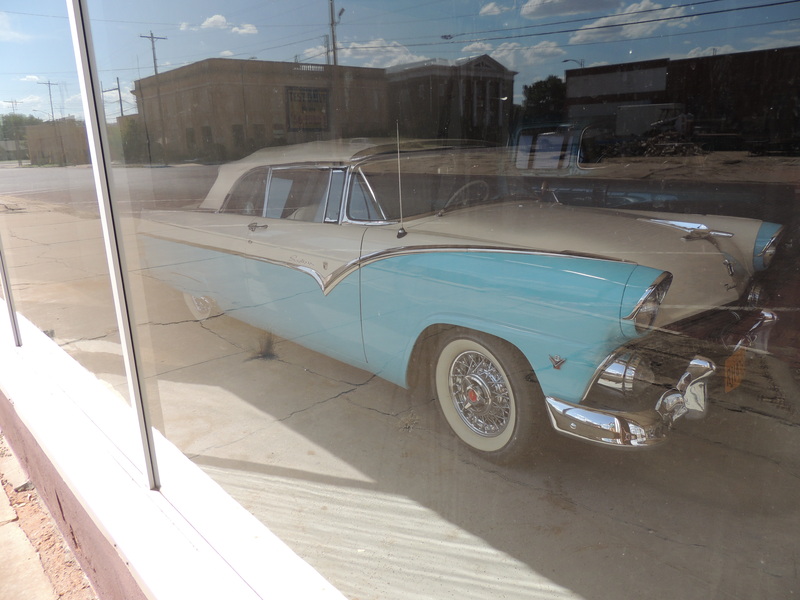 And, without further adieu, here it is: Road Trip Blog Day Three. On the morning of day three, we packed up and then headed out to a Target near the hotel where I ended up buying my new camera! I set up my camera in the car on the way to seven falls at the edge of Colorado Springs. 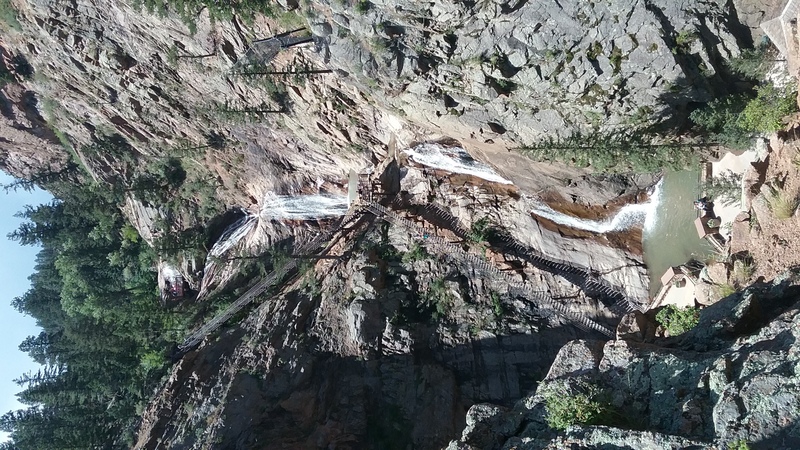 Seven falls is this really cool nature place where you hike up about a mile to see the falls. Overall it was a pretty hike: there were wild flowers on both sides of the path, a small stream to the right with birds playing in it, and steep mountains of rock sloping up on either side. Sadly, although I had brought my camera with me, it ended up that it could only hold three photos without an SD card, so I needed to use my phone camera. When we got to the top of the trail there was a large rock with the falls. It was pretty, but to be honest the falls weren’t as large as I had expected. Despite this, it wasn’t disappointing considering how nice the walk had been. We took the elevator to the top of a lookout point where you could see the falls beautifully. We had actually gotten lucky with our timing because the lookout point had been closed all morning because there was a couple getting married on it and the ceremony had just ended by the time we got to the end of the trail. Seven falls ended up taking a lot longer than we had expected, so we left for Saratoga a bit late but it was definitely worth it. 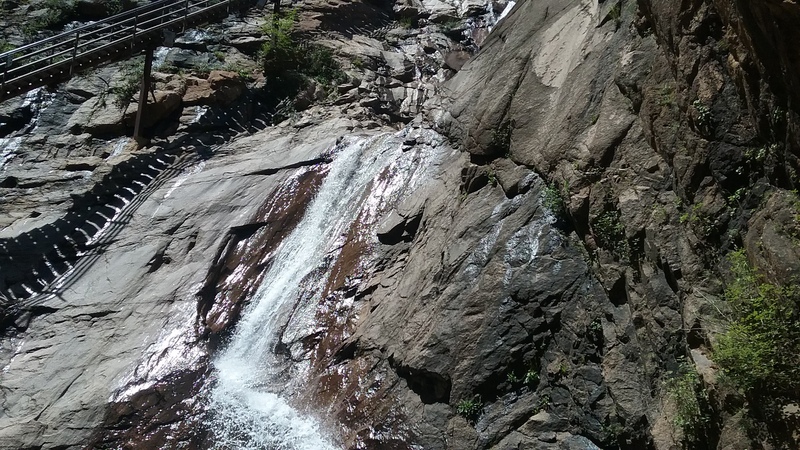 So, after seven falls we went back to Target to get my camera an SD card and then headed towards Saratoga. 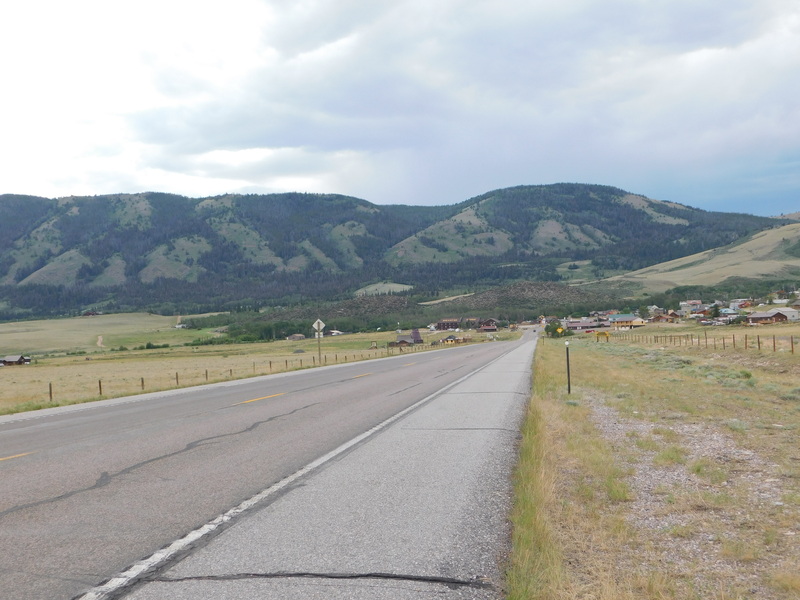 The drive from Colorado to Wyoming was gorgeous although once we got on top of the mountains in Wyoming it was fairly flat. 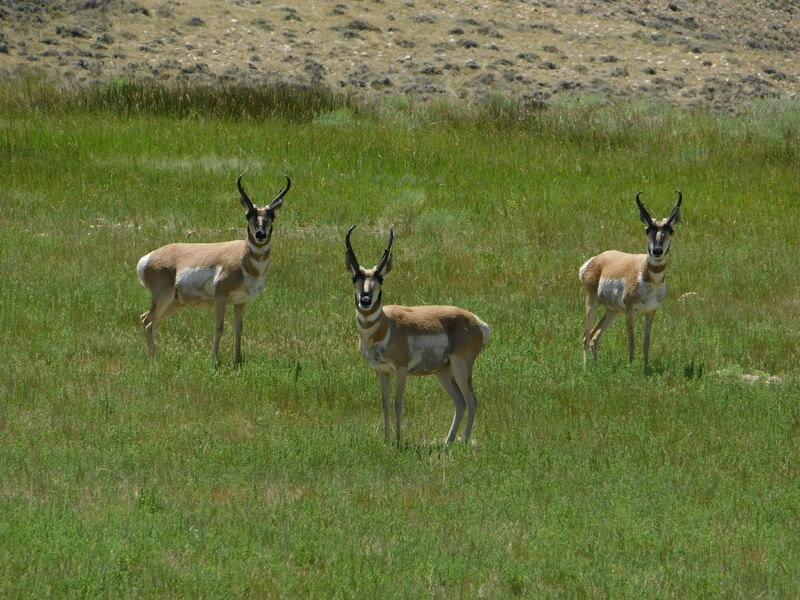 We did get to see more of the Pronghorn Antelopes like the ones we had seen in New Mexico though which was cool. 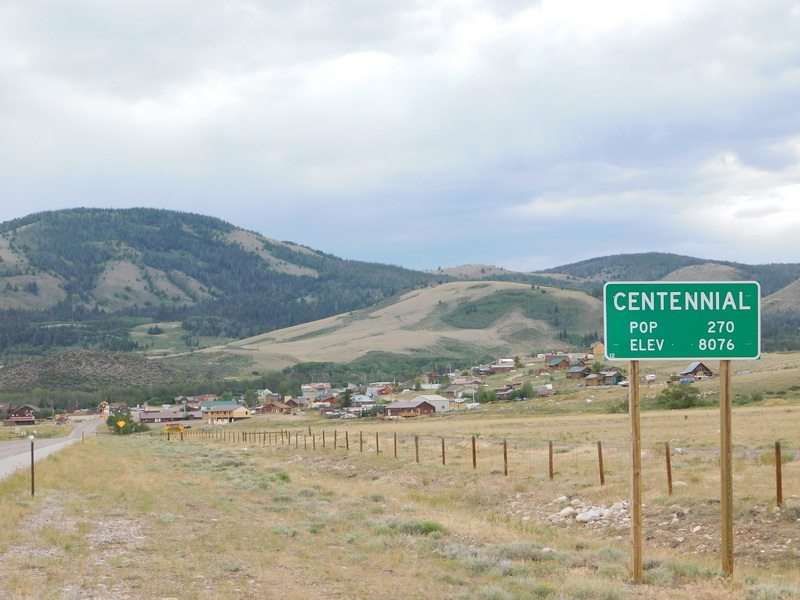 Also, in Wyoming we came across this really pretty town with a population of 270 called Centennial and I had to stop for pictures. I really love these pictures just because they look so unrealistic. 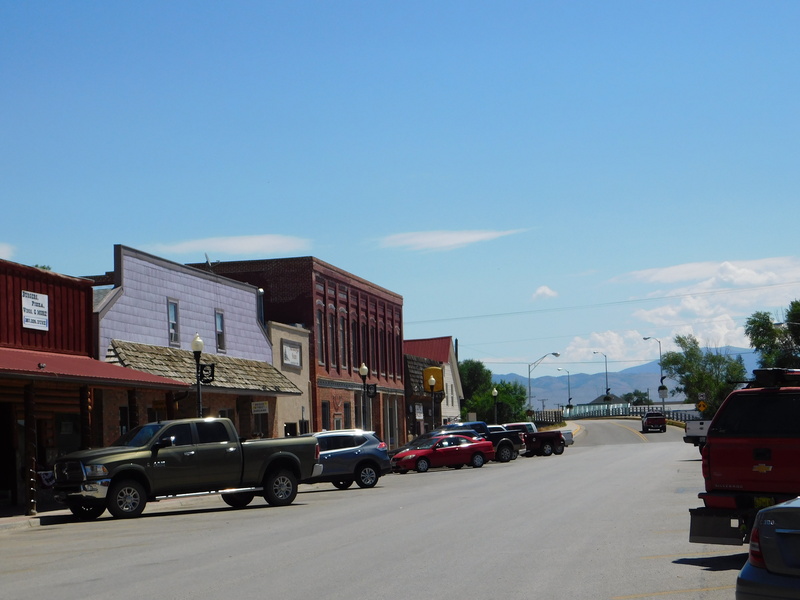 The town was such a speck compared to the barren plains on top of the mountains in Wyoming and it looked so pretty against the mountainous backdrop. 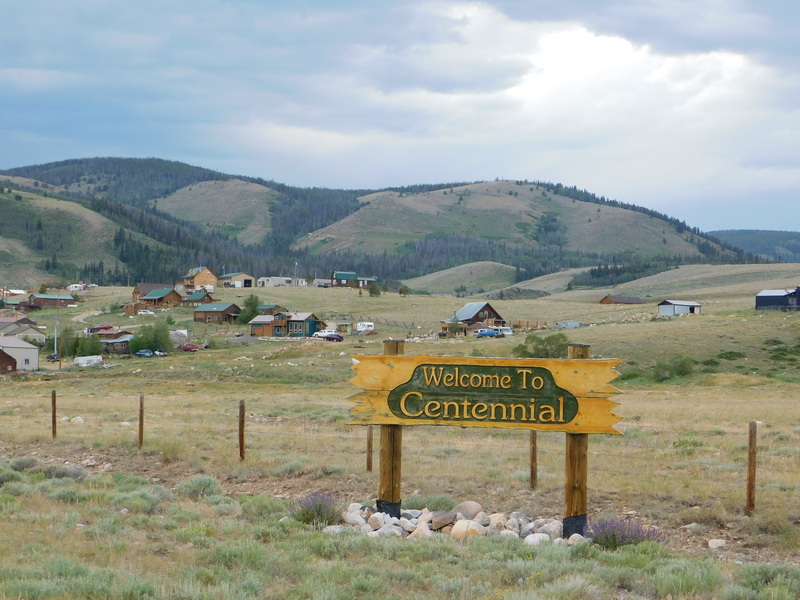 By the time we had gotten to Centennial we were only a few hours from Saratoga. 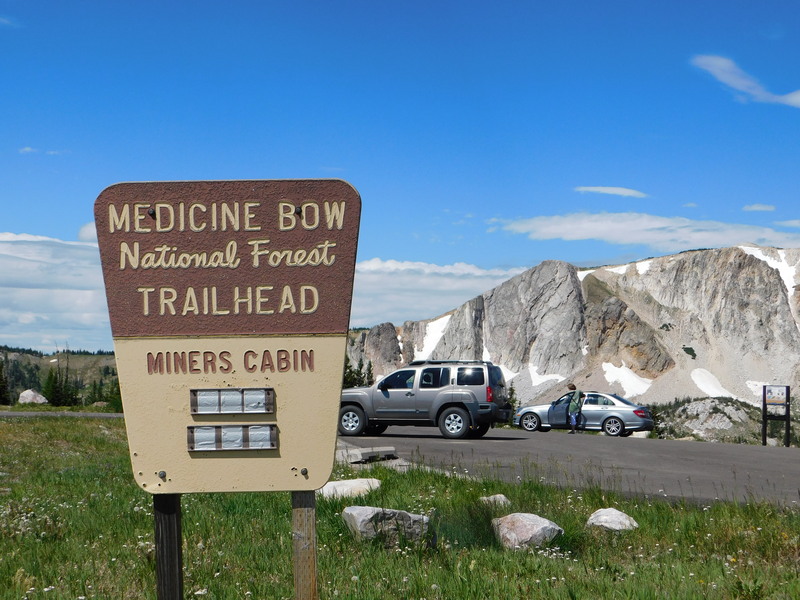 From there it felt a lot longer though because we had reached Medicine Bow National Forest which is huge. To make matters worse, as it got dark it began to rain really hard and the roads curved a lot. After awhile the rain stopped and we made it to Saratoga. 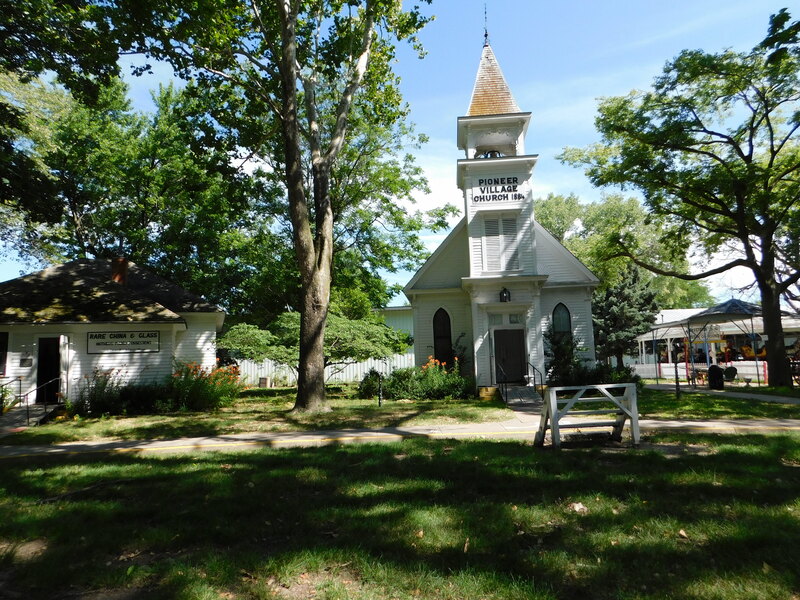 Saratoga has a population of 1,600 and is this really cool old town. 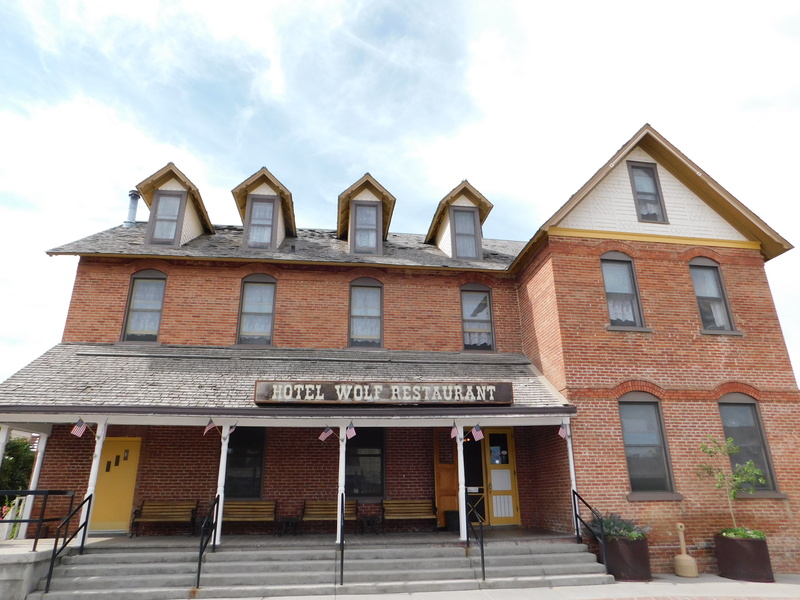 The hotel we stayed in was built back in the 1800s and called the Hotel Wolf. We stayed in the room with the two windows farthest right on the second floor. That night we ate at the Hotel Wolf Restaurant which made really good real steak hamburgers. Also, I must add that the hotel was really cool. The room was decorated very nicely and to match the old fashion utilities and atmosphere of the hotel. Despite it being old, the hotel was also very clean and well kept. 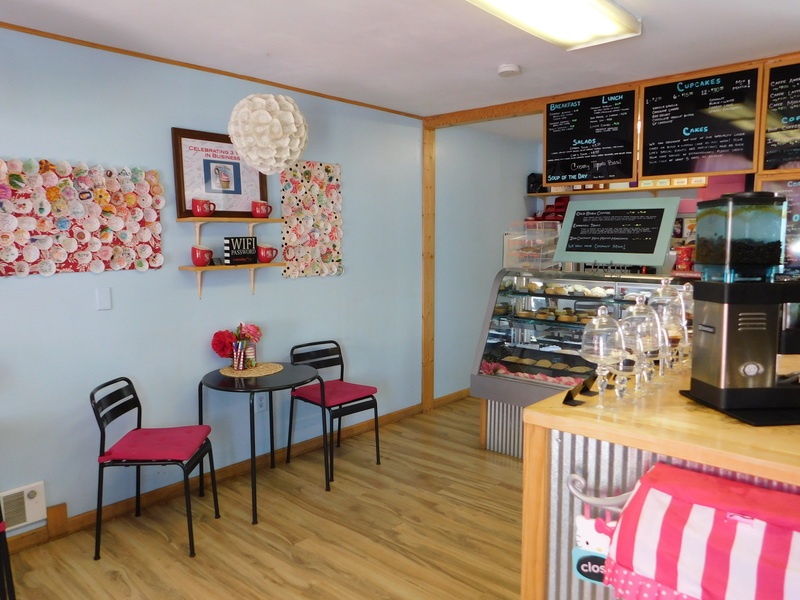 The only downside was that there was no AC, but we were able to open the windows to get cool air. Overall, day three was very fun. So yeah, that was Road Trip Blog Day Three! I hope you all enjoyed and keep watch for Road Trip Blog Days Four and Five which come out on Friday! Then, the Road Trip Blog Finale will be posted next Tuesday. Thank you for reading! The morning of the second day was pretty calm. We took our time to get ready and get things packed up before heading downstairs to eat breakfast. 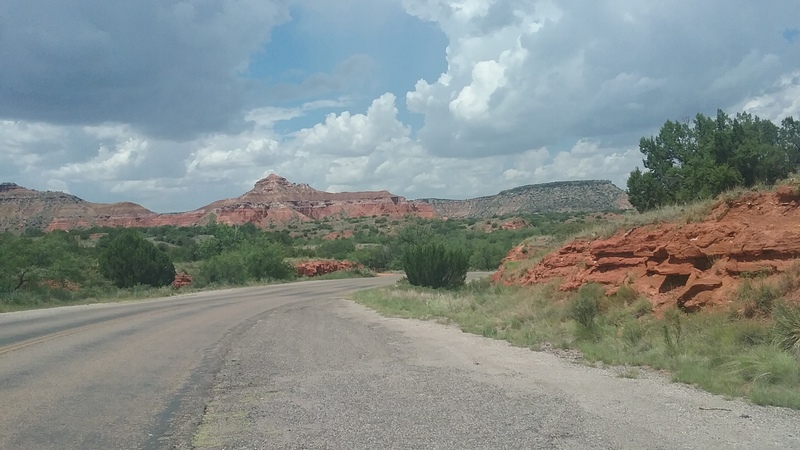 I had received a map of Amarillo with all of the tourist attractions on it the night before and circled the ones I had already implemented in my road trip binder along with ones I thought were interesting so it was easy to know where we were headed. 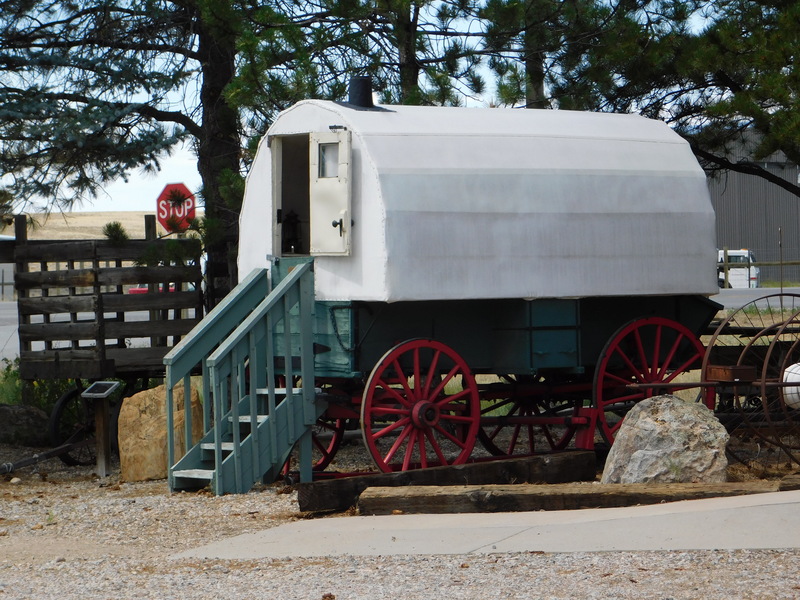 The first place we stopped was the RV museum. Unfortunately, when we got there we discovered that it was closed on Sundays. 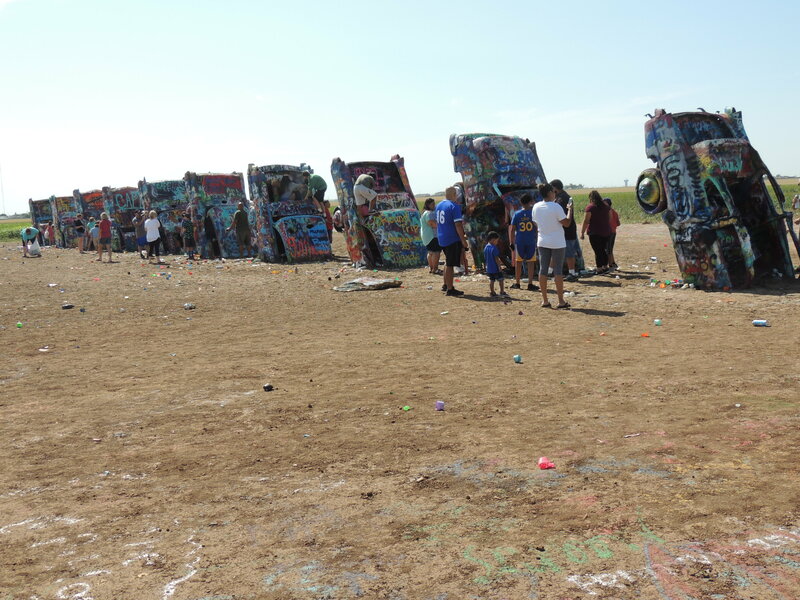 So, after that we headed off to the well known landmark Cadillac Ranch. For those of you who don’t know, Cadillac Ranch is ten vintage Cadillacs stuck in the ground in middle of a corn field off the side of a highway. As a man had told us on the way in, Cadillac Ranch is basically America’s Stone Hedge. We brought sharpies to sign the Cadillacs with, as is custom, just to find that they were soaking wet with spray paint. Luckily, there was a family who was leaving and giving away their spray cans. I signed the first Cadillac from the left twice and than my whole family signed one of the others. Honestly, the experience was so strangely satisfying. Especially considering there were so many people. People were coming and going CONSTANTLY. 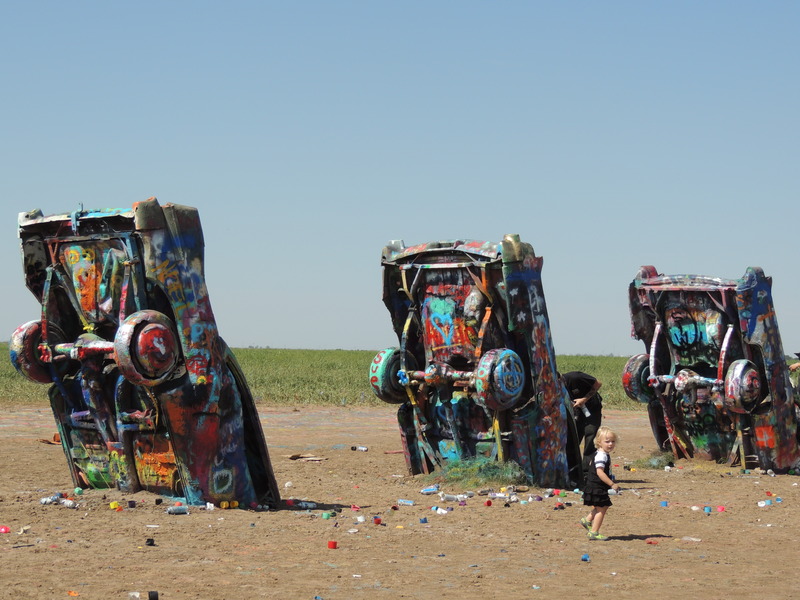 Three of the Cadillacs at Cadillac Ranch. 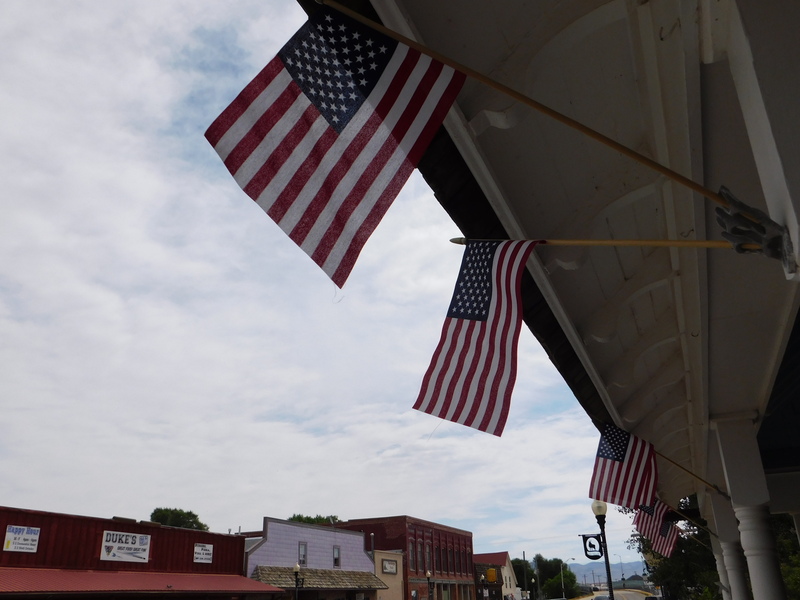 After Cadillac Ranch, we headed back towards the center of town to explore the Route 66 Historic District. 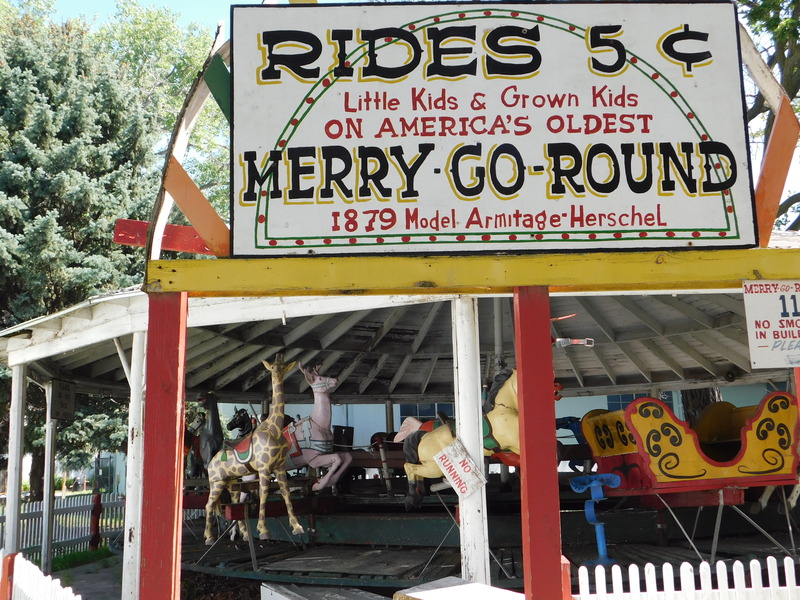 I have to say I was slightly disappointed with it because it was kind of sketchy and the image I had found on Route 66’s website didn’t turn out to be around the area. It was still really cool to see though. 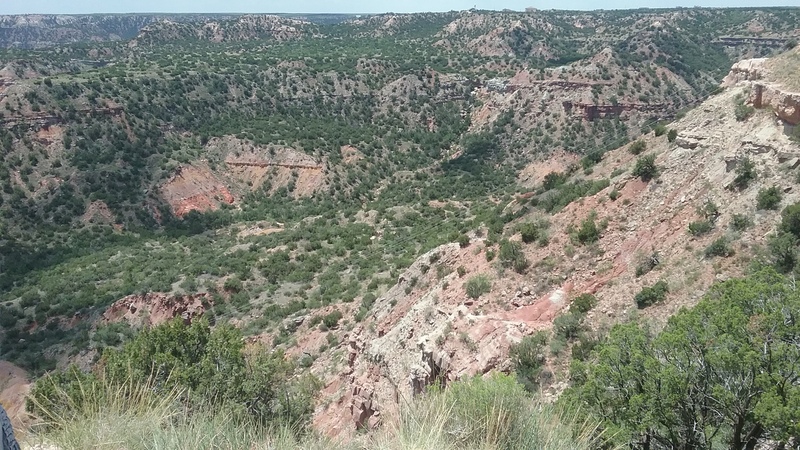 For our final thing to do in Amarillo, we went to the Palo Duro Canyon. Note that the pictures I took there aren’t nearly as good as the ones from before it because the camera I was using was dead and I needed to use my phone camera. Near the entrance to the canyon. Down near the bottom of the canyon. 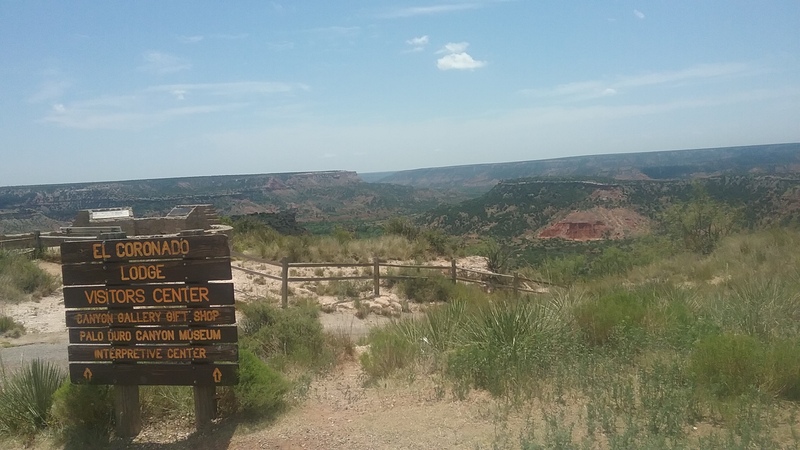 When I was planning the road trip I didn’t included Palo Duro canyon in the plans because I hadn’t seen it online, but I must say it was amazingly beautiful and I am so happy that we went. 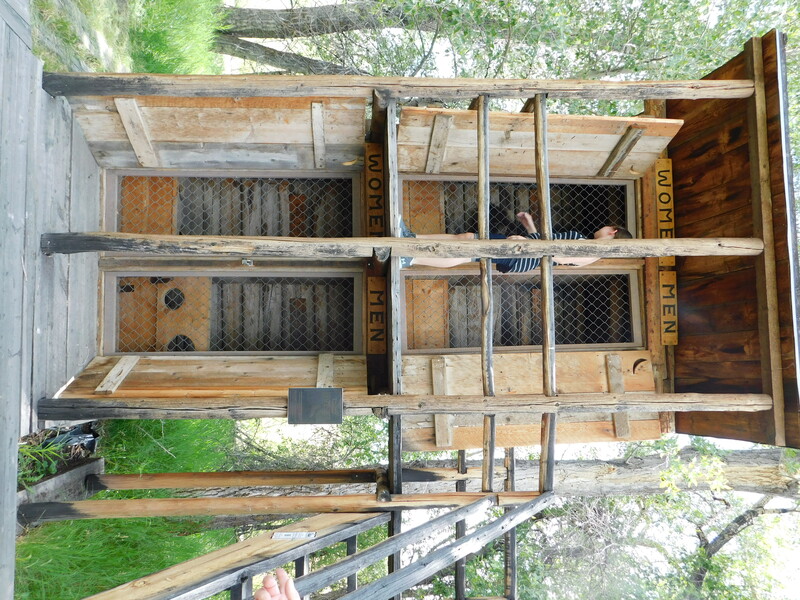 The best part was that we were able to go all the way down to the bottom of the canyon where there was a trading post. 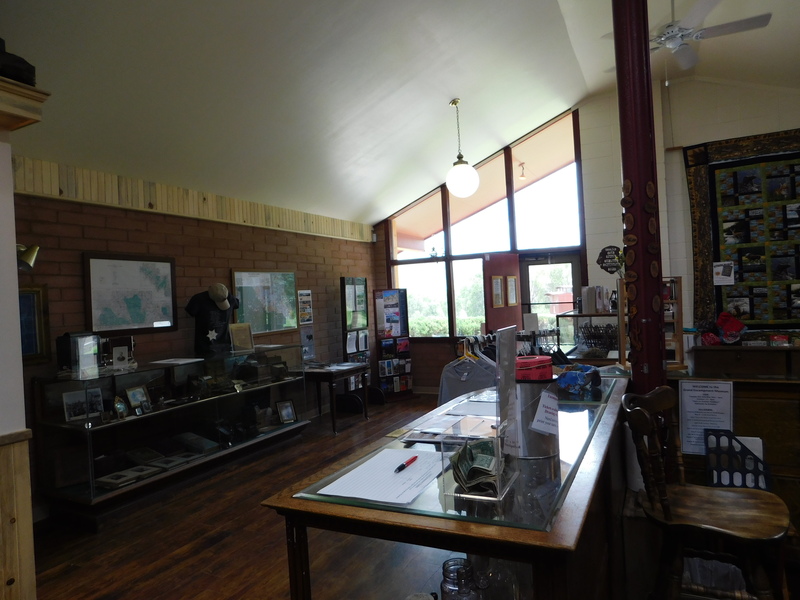 Also, in the gift shop there was a hallway made into a mini museum telling the history of the canyon and about the Native Americans that used to live there. I definitely recommend visiting it if you haven’t already. 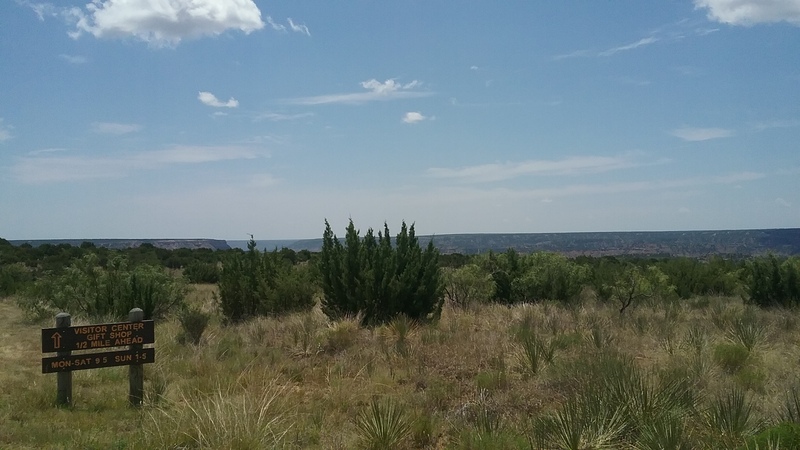 After Palo Duro canyon, we were on the road again. We passed through New Mexico on the way to Colorado and I got to see a lot of really cool rock structures and Pronghorn Antelopes. Because we spent so much time in the canyon, we got to Colorado Springs pretty late but the hotel was nice. Thanks for reading guys! Road Trip Blog Day Three will be coming out on Tuesday so keep watch for that! Hey guys! As many of you already know, for the past five days I have been on a road trip with my family. What you don’t know is where I have been and what I have been doing. So, here is my recap of day one and day two will be posted tomorrow. Also, as always, don’t forget to follow all my social medias and to stay active. And, most importantly, don’t forget to sparkle! 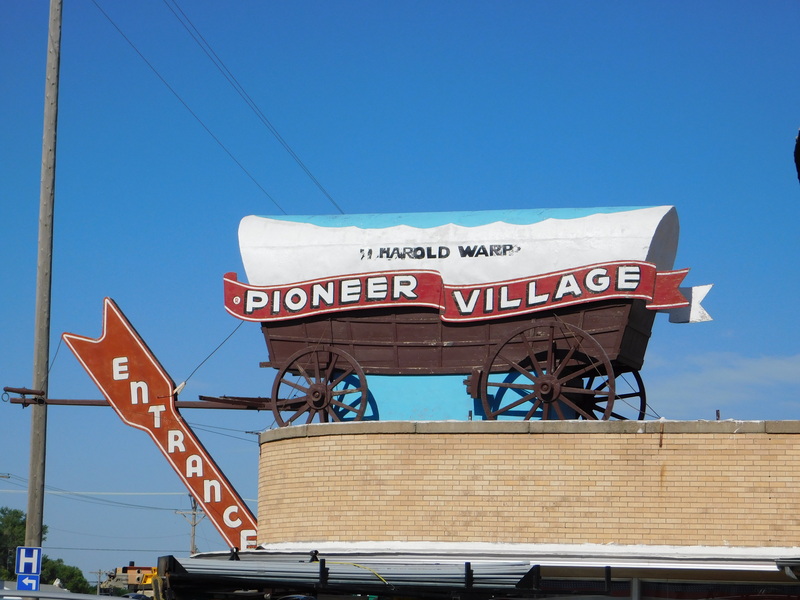 Our first destination was Amarillo, Texas. We packed the car, dropped my dog off at his doggie daycare, and left my cat with lots of food and water in the morning before hitting the road. I’m not exactly sure when exactly we left, but I think it was around noon. Although the ride was long, about halfway through we came across this really cute small town called Childress. 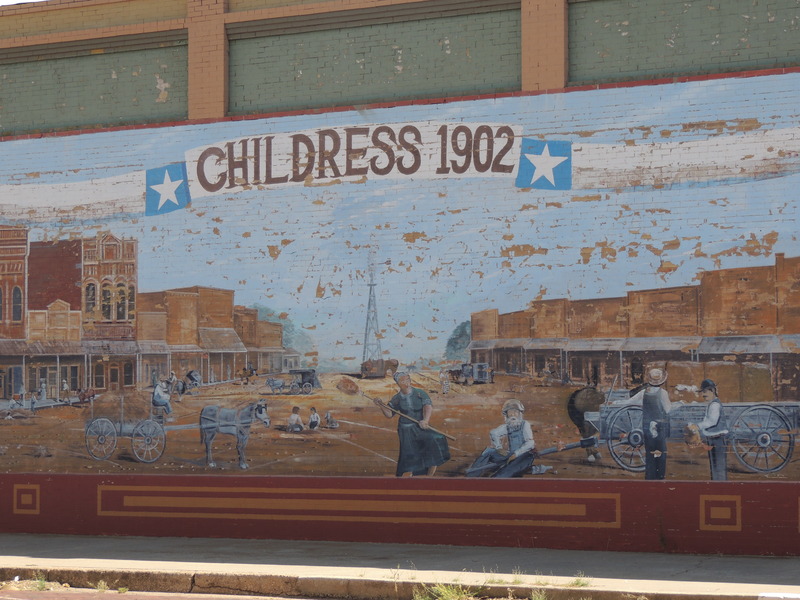 Childress was founded 1902 and had a lot of really cool old buildings, cars, and an old train. A painting on the side of one of the buildings in the center of town. 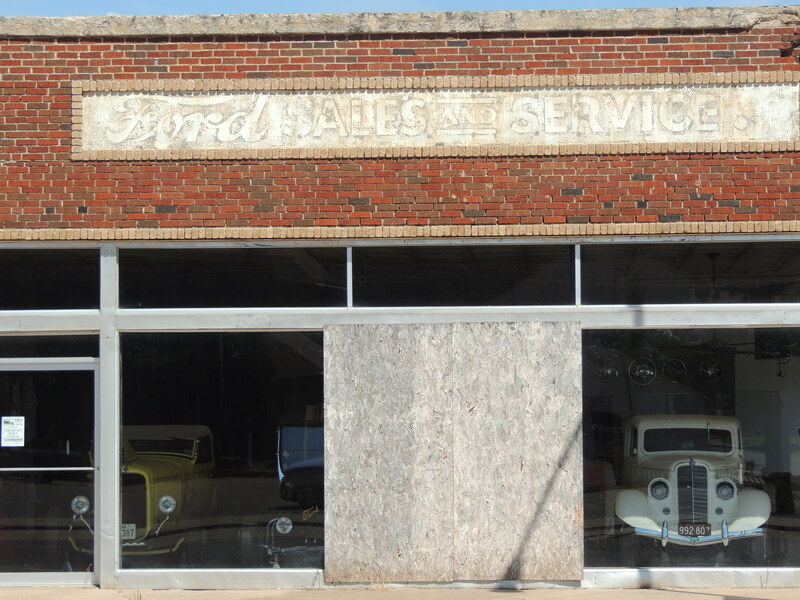 An old Ford store full of vintage cars. A hotel on the edge of town. 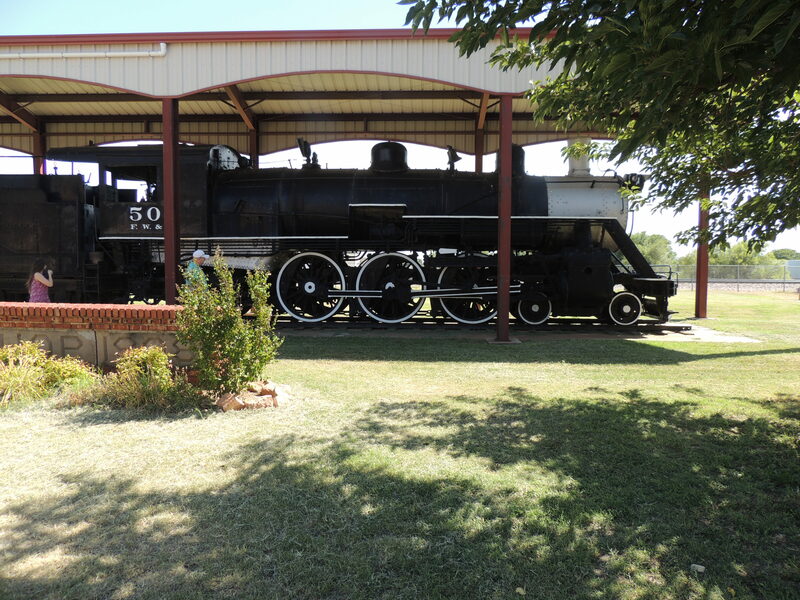 The train on display in Childress. 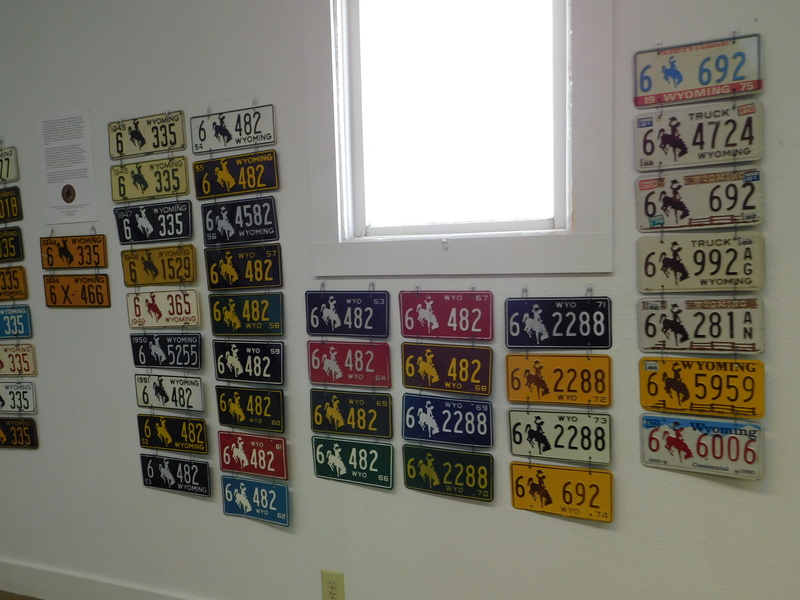 If any of you ever find yourselves a few hours south of Amarillo, I highly recommend that you stop in Childress. After Childress, we kept on driving so that we would make it to Amarillo before it got dark. We got to the hotel pretty late so we didn’t really explore Amarillo much, but we did stop at a Target near the hotel so that I could buy a camera I had been reading about online to use on the trip. I was looking for the Nikon Coolpix L340 but unfortunately they told us that Target was discontinuing selling the item. After we got back to the hotel we settled in for the night. The room was really comfortable because it was split up into two smaller bedrooms and a main living area. So, me and my sister watched Say Yes to the Dress on TLC and Toy Story 3 on Freeform before going to bed sometime just before midnight. Even though we didn’t do a whole lot on the first day, it was still very fun. Also, we did A LOT on day two so make sure to go check that out here.